Chocolate Covered Strawberries – One Half Indian. My grandmother is the chocolate maker in my family. She even makes her own fondants and caramels for her chocolates. My favorite chocolate she makes is chocolate covered cherries, which are somewhat involved. I think the next best thing is strawberries in chocolate because you still get that citrusy burst mellowed out by the smooth chocolate. When I made chocolates with my grandma or mom growing up, we used specially ordered chocolate that came in 5lb slabs. It is an extra rich blend that can be mixed with some lower grade chocolate. I do not order 5lb slabs of anything, so I needed to find a mix that was high quality but could be purchased at the grocery store. I ended up using 2 parts Ghirardelli 60% Cacao bar and 1 part Ghirardelli semi-sweet chocolate chips. It is a darker chocolate but well balanced and paired with the strawberries well. The last thing I want to mention about making these strawberries is the melting method. I know that fancy chefs use a double boiler to melt chocolate, but I have honestly found the microwave to be the most effective melting method. It is the way my grandma originally showed me, and it works well for me. The key to melting chocolate is to keep it at a low temperature. That will keep it from seizing up and will give the chocolate a nice shine when it dries again. I put the microwave at 30%-50% power and microwave my chocolate for 30 second intervals. Between each interval, I stir, even if the chocolate looks no different than before or if the chocolate is only a little melted and becoming a blob on the spoon, stir. This helps the chocolate melt itself as some parts become melted and warm and then warm the other bits of chocolate while you stir. When I finally finish microwaving my chocolate, there are generally still a few small chunks of unmelted chocolate that go away as I stir. In my opinion, that is ideal. When you finish, the chocolate should not feel hot to the touch, but lukewarm ish. 1. Wash and dry your strawberries. I like to leave the green tips on because I think they look pretty. Feel free to cut these off if you do not like them or if you want to cover the entire strawberry in chocolate. Make sure strawberries are completely dry before dipping. 2. Prepare the chocolate. I don’t actually measure when I mix the chocolate. I just sort of eyeball it. I think 2 parts Cacao bar and 1 part semi sweet chips is a good ratio to stick with. To achieve that, Break up the whole bar into small pieces and add in about 6 oz of the chips. Put the chocolate in a microwave safe bowl. 3. Microwave the chocolate on for 30 seconds on 40% power. (Depending on the microwave, your power settings may give different heat. If the chocolate feels hot after removing it, then lower the power setting. It should take several rounds in the microwave at this low setting). After 30 seconds, remove the chocolate and stir. Repeat this process until the chocolate is melted and runny, but not hot. MY grandma always told me that the best chocolate will be melted yet feel cool to the touch. 4. Prepare a tray covered in wax paper. I didn’t have any wax paper on hand so I used foil and it worked fine. the nonstick tray with no cover probably would have worked as well, but would have required more clean up. 5. Dip the strawberries in the chocolate. I try to keep my fingers on the top of the strawberry where you do not plan to put chocolate. It’s okay if a little chocolate gets on the green part. When I dip, I dip the strawberry and sort of swirl it around in the chocolate to be sure that all sides get evenly covered. Lift the strawberry out of the chocolate and let some of the excess chocolate run off the strawberry. Place the coated strawberry gently on the wax paper. 6. Repeat with all other strawberries. If your chocolate begins to get thick and hard to work with, pop it back in the microwave on a low power setting for 30 seconds to get it nice and runny. If the chocolate begins to thicken and cool, it becomes difficult to make the strawberries look pretty and evenly covered. 7. Let the coated strawberries set. I placed my tray in the fridge for about 30 mins. 8. This part is optional. The strawberries will be delicious and elegant without the white chocolate. But if you want to decorate with white chocolate…Melt about 4 oz of the white chocolate in the microwave following the same instructions for melting as before. 9. Dip a small spoon into the white chocolate and pull it out. Place it over the finished coated strawberries and zig zag back and forth. Small lines of white chocolate will begin to fall elegantly on your chocolate strawberries. I do this with maybe 3 or 4 strawberries at a time. 10. Place strawberries back in fridge for another 30 mins or so to set the chocolate. 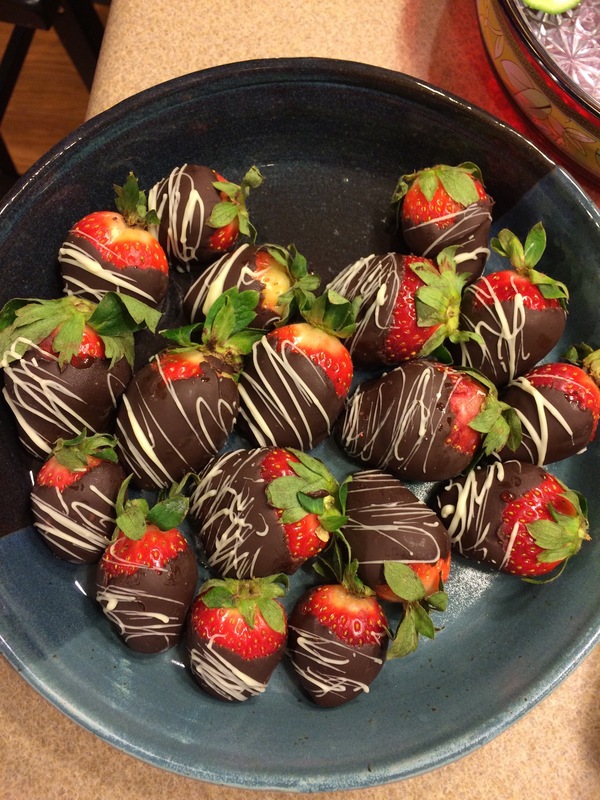 When chocolate is set, trim the edges of the strawberries where wild pieces of chocolate have dripped away. This gives the strawberries a finished and professional look in my opinion.